If I don't bring it, it will break. 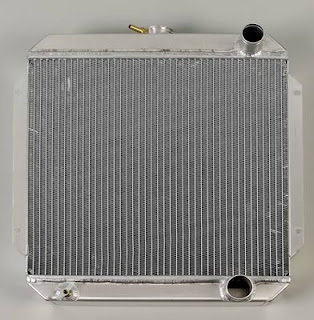 The radiator I have picked out is one of the best names in all of racing and it will serve this project perfectly since it is larger than even the one found in my big block Shelby. While ordering something as simple as a radiator may seem very basic, it becomes even more complicated when you realize all the variables. There is the opening dimensions and any conflicts with other mechanical items. There is the need to know which side the radiators hose outlets are on so they align with the water pump. Which water pump fits the engine, location of the thermostat housing and so much more which means asking lots of questions and more importantly knowing the credibility of the specialist (?) you are asking. For every 100 people that say, "The way I used to do it is..." there are only two who truly "know" what's right. Sorting out who's right and wrong is the real art of building a great car. Today I went to the engine builder to drop off my block and while I was there I checked out some of the parts we had ordered for me. It was like Christmas. I have always been under the belief that every good road trip deserves a good tune and this race thru Mexico will be no different so sit back and enjoy the new La Carrera Panamericana theme song. Today I began tearing down the engine that I removed from the donor car I bought for parts. Regreatfully, after I got a closer look at the donor car back at my shop I began to realize I had acted to hastealy in purchasing it. It was a turd from the word go and I literaly had it hauled away to the dump after removing very few parts. As a matter of fact, with the exception of the engine all I got fit into a small box. Since everything else was in such bad shape I had little reason to think the engine would be any better off and as I began tearing it down I had even more reason for those feelings. Brakets were home-made. Parts were wrong and mixed up and so on. When I finally got it striped down I decided to check out the casting number so I wrote it down and went home. This is when things began to get good. Have you ever heard those stories about some guy finding a rare car in some old barn under a tarp and buying it for $50 bucks? Well, now you can add another one of those stories to your list. After very carefully checking and then driving back to my shop one more time to re-check the casting number, it turns out the block in this donar is the exact same block Carol Shelby used in the 1968 Shelby GT350's!!! How in the hell it ever wound up in this old donor bucket is beyound comprehension but I am thru asking questions. Next week it will go to the engine builders to be cleaned and magnoflexed and so on. So I am keeping my fingers crossed until then. Over the last few days I was at IMPACT ENGINEERING checking out the beginning of the roll-cage install as well as the work they are doing cutting and preparing the doors to accept the Nascar bars that extend into the doors for optimum protection for both driver and navigator. After some discussion it was agreed that after the cage was built the door bars will be left un welded to as to make easy access to the inside while I perform all the inside work. After all the inside is completed the car will be returned to them for the final touches. The work Anthony and Dave at IMPACT ENGINEERING do is by far the best available and the detail they go to is tops bar none. Part of what I like about them besides the personal attention is how they "listen" and "remember" to what I have discussed with them possibly weeks ago. When many shops would have forgotten things we spoke about these guys have proven to me that they have "MY" best interest in store. What an excellent place to do business with especially when considering we are primarily interested in safety. Another factor is knowing they are the best at what they do but like many shops they don't have that "Holier than thou" attitude and they respect my in-put as well. I would like to tell anyone who needs top quality work of this sort done, they are the bomb! Like the monkey said when he got his tail caught in the meat grinder... "It won't be long now." While the car is having it's cage built not to mention the fuel cell cage and some other goodies I just can't seem to contain myself. I will be going over there this weekend to discuss plans for all that will be done. After they are finished with the car it will go back to the body shop to be fitted with new fiberglass parts and then painted. After that I can get to work doing what I enjoy so much. Details, details and more details. Simplicity is good but there can be no excuse for lack of attention when building what will be a winning car. Over the last week I have had numerous business appointments that have kept me more than busy but this weekend I have a bit of a cold so I will get rested up but in the mean time my son Will and my navigator Jon will be racing at one of our favorite tracks... Laguna Seca. No doubt they will be thinking how fast and fun it will be to drive the new car there when it's completed. But in the meantime, enjoy this video of a GT350 in a race. Oh sure, unlike the La Carrera Panamericana, there are no cliffs, donkeys, cattle, trees, and lack of safety but what the hell, it's racing.